Inflatable Party Magic presents this Unicorn 4n1 bounce house combo that has a realistic 3-D unicorn on the front that creates that wow factor effect. The unicorn is so real and life-like that the kids can't wait to run and touch it. This bounce house combo will make any little girls dream come true! It has a bouncing area, basketball goal, climbing wall, and a single lane slide. It goes great with Unicorn themed parties. It features the following items for safety: entrance step, netted windows for ventilation, and the ability to see what the kids are up to at all times. 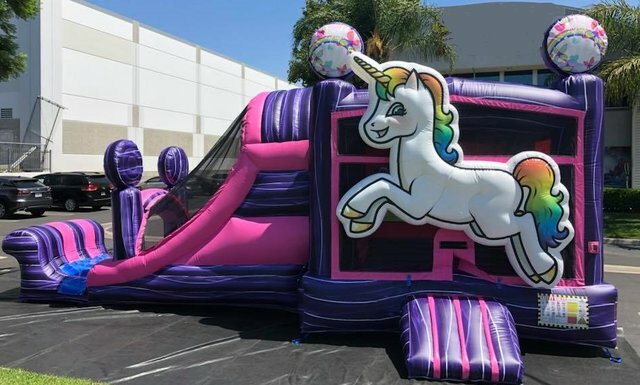 The Unicorn Bounce House Combo is a 15ft. X 28ft bounce house combo. This inflatable is great for ages 2 to 12. Adults don't worry, you can play too. The age rating is just for the fun factor as our units are commercial grade and can be used by adults as well. The Unicorn bounce house combo will get the kids ready for fun and a mystical adventure at their next party!